The comprehensive diamond evaluation feature that gives you more information than any other online diamond retailer, only from B2C Jewels. An independent lab certificate can tell you a lot about a diamond. But it can’t tell you everything. What if there was a way that you could judge the sparkle of a diamond and see exactly how its internal characteristics affect its appearance while shopping online? Now, with Diamond Blueprint from B2C Jewels, there is. With our exclusive Diamond Blueprint, B2C Jewels gives you all the information you will ever need to make an informed diamond buying decision online. 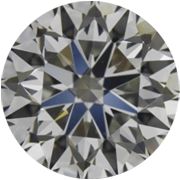 We use cutting edge technology to provide our customers with every detail about their diamond. Usually, you would only be able to obtain this information from a state of the art gemological laboratory. Most retailers would only be able to provide you with a fraction of the information that we are disclosing. It’s more than a “cert.” It’s a blueprint. Diamond certification by an accredited gemological laboratory remains one of the most important tools today in the identification and valuation of diamonds. But a certificate or “cert” can only tell you so much. Our Diamond Blueprint is a total picture of all of the elements that make your diamond unique. 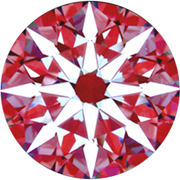 We provide certified diamonds with diagrams of their internal and surface characteristics. 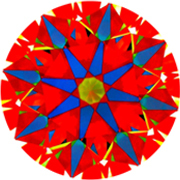 Known as “plots”, these diagrams are very useful, but they don’t show the whole picture of a diamond. A cert will identify the carat weight, dimensions, the clarity, color, and cut grade of your diamond. 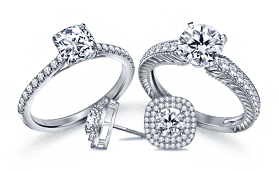 Our Diamond Blueprint will show you how your diamond performs. With Diamond Blueprint, you can see an actual digital image of your diamond before you purchase it. Our sophisticated zoom features enable you to see even the microscopic characteristics that make each diamond unique. It’s like seeing your diamond through a jeweler’s loupe without ever having to leave your home or office. If you have ever wondered what the different clarity distinctions really mean when it comes to a diamond’s appearance, our magnified digital images will show you everything you need to see. You can determine with your own eyes which clarity characteristics are acceptable to you. Diamond performance may sound like an unusual concept. The way your diamond reflects white light back to your eye and the way it breaks light into its spectral colors determines its fire and brilliance. These two important effects are what make diamonds so desirable. With Diamond Blueprint, we provide you with spectral photography that allows you to see how your diamond interacts with light. We use high tech, patented ASET photography to demonstrate how your unique diamond reflects and refracts light. 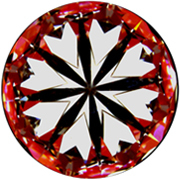 Developed by the American Gem Society, one of the most respected authorities in the diamond and gem industry, ASET stands for angular spectrum evaluation tool and is a definitive look at the optical performance of a diamond. A cut grade will tell you if your diamond is an excellent or good make. What it can’t tell you is if all the facets are in alignment or how the proportions impact the overall appearance. By using advanced 3D scanning and modeling technology, we can present you with detailed information about your diamond’s proportions. Using devices such as the Ideal-Scope, the kind of sophisticated equipment used by diamond cutters, we can show you even minute variations that would otherwise be impossible to evaluate with an untrained eye. The Diamond Blueprint gives you multiple exact measurements to the hundredth of a millimeter. Symmetry is frequently found in nature and creates visual harmony that is a pleasure to behold. Diamond cutters strive to attain symmetry while at the same time trying to preserve as much carat weight as possible. 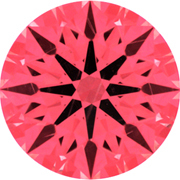 The coveted “hearts and arrows” pattern has become the paradigm of round brilliant diamond symmetry. 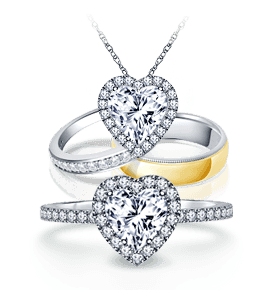 Diamond Blueprint provides you with an actual top to bottom view of your diamond that enables you to see for yourself how closely your diamond adheres to the desirable hearts and arrows pattern. 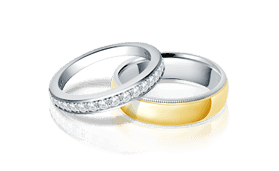 Diamond Blueprint is a service we offer because we want to be your preferred online destination for diamonds. We seek to eliminate the hassles of online shopping and provide you with all the service you expect from a retailer. We have leveraged our expertise as diamond manufacturers and wholesalers to show you what others cannot: the exceptional details that intrigue the eye and inspire the imagination. Let us put your mind to rest and trust us to show you everything your diamond will reveal, most importantly, before you purchase. Start exploring Diamond Blueprint today and see for yourself the level of excellence brought to you by the diamond experts at B2C Jewels.